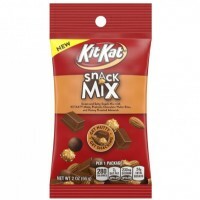 Take a well-deserved break with the Kit-Kat Snack Mix Tube. 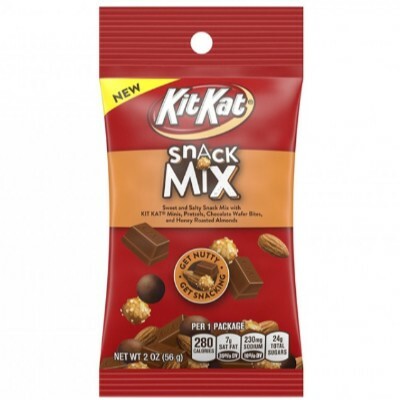 Featuring convenient, individual packs and the iconic chocolatey taste of Kit-Kat morsels, crunchy roasted almonds, and crisply salty pretzels, this snack is the perfect way to keep your energy up throughout the day while satisfying your sweet tooth. Milk chocolate (sugar, skim milk, cocoa butter, chocolate, milk fat, lactose (milk), soy lecithin E322, emulsifier , vanillin artificial flavor), enriched wheat flour (flour, ferrous sulfate (iron), vitamins B3-B1-B2-B9), almonds, sugar, wheat flour, vegetable oils (palm kernel, canola oil, safflower oil, sunflower oil, corn oil, cottonseed oil, soybean oil, and/or palm oil), 2% or less of: salt, honey, chocolate, maltodextrin, corn syrup, molasses, soy lecithin E322, color E150, acidity regulator E500ii, yeast, vanillin artificial flavor. Manufactured in a facility that also processes peanut and other tree nuts. Nutrition facts (for 100g): calories 500Kcal, total fat 25g (saturated fat 12.5g), total carbohydrate 64.3g (sugar 42.9g), protein 8.9g, salt 1g.